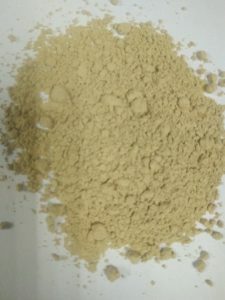 Bentonite – Fabrimetrics Philippines Inc.
Bentofab is a product of Fabrimetrics Phils Inc. It is composed of Sodium Bentonite. It has been proven to be one of the best sealant in the industry. Bentonite swells many times its volume. It forms a strong water and chemical proof seal that makes it a permanent and inexpensive liner. Bentofab is environmentally friendly as it does not contain chemicals, additives, or toxins. Sodium bentonite is environmentally friendly and safe to use. Bentofab has an exceptional property called thixotrophy. When mixed with water, and mechanically stressed, it reacts like a fluid. When inactive, its viscosity increase and hardens. Bentofab can be used as liner for fishponds, artificial lakes, and dumpsites. It can also be sandwiched between geotextiles and woven polyethylene to create a geosynthetic liner to proveide ease of installation. Bentofab, as a flush fluid, seals the drilled shaft from entry of water downwards at the side of the shaft. The particles of the bentonite coats the borehole wall. It then swells and harden to forms a firm sludge cake around the bore wall which gives the hole stability.